An Heir Apparent for H. R. Giger? Killing Time (2007). By Jud Turner. Hallowe'en - are we there yet? In my run-up to this autumn festival, I have to thank my friend J. for coming across the American artist I'm mentioning in my post today. The artist's name is Jud Turner. He's a Gen Xer from Oregon, and he is taking H. R. Giger's themes to a new, Post-Postmodern industrial level in his sculptures. By Post-Postmodern in this case, I mean the juxtaposition of different time periods in a single existential narrative. Turner's aim appears to be to create and somehow shockingly reconcile paradoxes. He installs the ancient or the fossilized within industrial sculptural constructions and goes one step beyond Postmodern messages about disjointed, navel-gazing subjectivity. 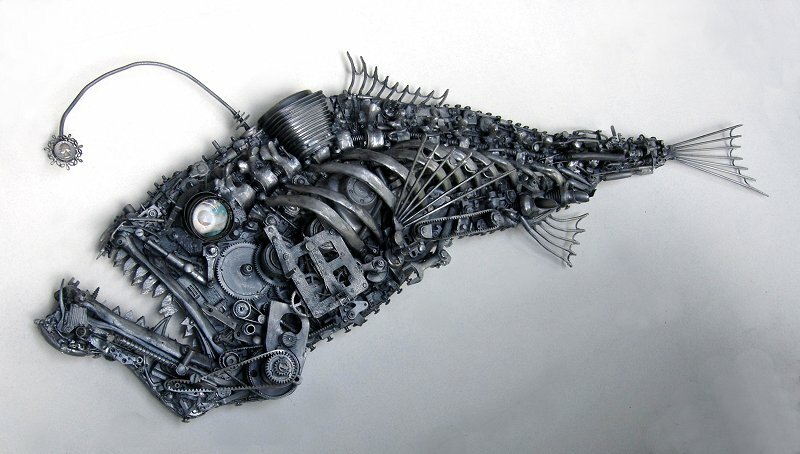 This produces some visceral, jarring results, as with the fossilized junkyard fish trying to eat a dime in the sculpture, Greed Eater, below. I haven't seen a better comment, anywhere, on the inflationary psychology that led to the Great Recession of 2008 to the present. 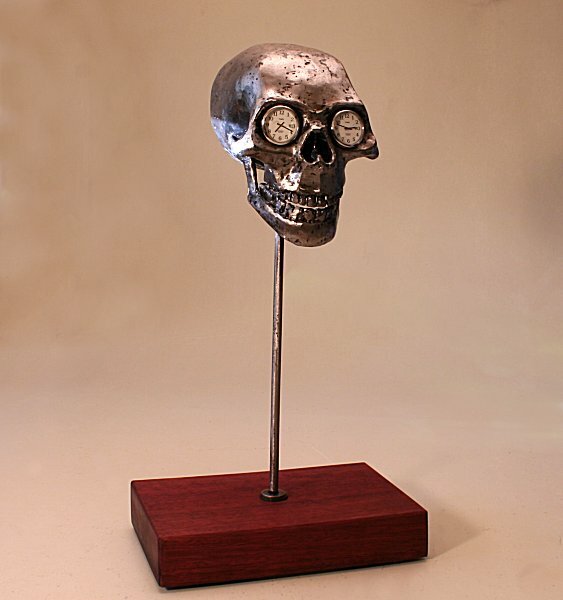 You can see more of Turner's sculptures on his homepage, here. 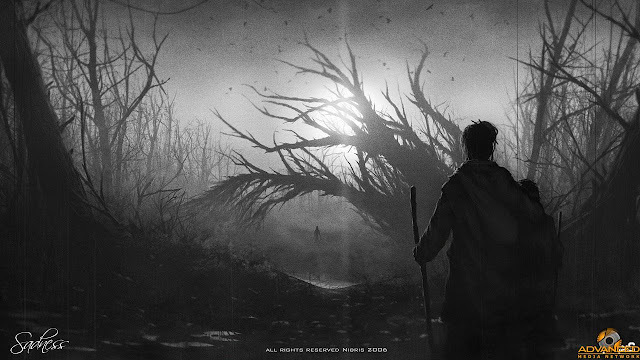 Greed Eater (2010). By Jud Turner. Childe Roland to the Dark Tower Came (1859). 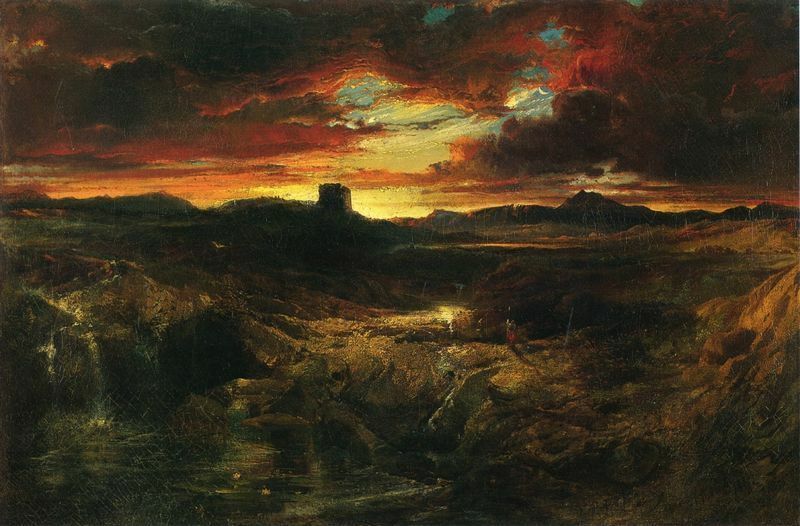 By Thomas Moran. Image: thomas-moran.org. The last couple of years have not been easy for a lot of people. Most are not out of the woods yet economically. Even if you've been doing relatively all right, you will meet or know someone affected by the Great Recession of 2008 to 2012 (?). Recessions and depressions strip away all illusions of security and replace them with hardship and the worry that our overall standard of living - indeed, an entire middling social class in the developed countries - is in decline. People regroup with friends and families, reevaluate their priorities, question themselves, their worth, their attitudes, and the values of those who led us down this merry path. With the gnawing worries over bills, debts and unemployment comes disillusionment. Scenes from a Multiverse: Canada Six, Insanity Wastes, Zones of Derision. © 2010 J. Rosenberg. Today, I've been looking at free Web comics, which have become one of the hot things in digital publishing over the past decade. Here are some titles that leave the old school pulp publishers in the dust. Each one of them uses the new medium in a clever way to capture our own, time-tossed cognitive dissonance. In no particular order, first up is, Scenes from a Multiverse, by Jonathan Rosenberg. If you want to laugh at the craziness of now, set in future dimensions, go have a look (Hat Tip: @KateSherrod). It's fantastic. Period. Sadness screenshot. © 2006 Nibris. All rights reserved. In 1999, the Pet Shop Boys put out a great lyric in their song, Happiness is an Option (which you can listen to here). This part of the song is about aging. One day, you wake up and don't recognize yourself in the mirror and you find yourself contemplating death. The image they conjured up hinted at the rise of a Retro-Futuristic Slavonic Gothic style, which has been slowly gathering steam over the past decade. 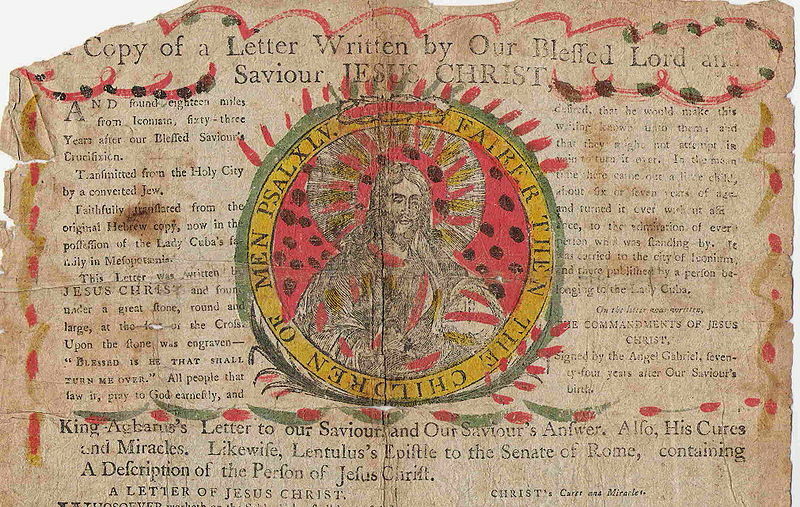 Chain Letter from Heaven, 17th century. Image: Wiki. Many of us have received those annoying chain e-mails that promise you money, love, or luck - but only if you immediately forward on the message to several of your friends and family. If you don't send the thing on, it threatens you with dire bad luck. It's not quite a chain letter, which illegally involves requests for money. This is more the superstitious variety, where the currency exchanged is your fate. Creepy, yes? The annoying e-mail that promises love or money seems to be one of those things that grew out of the Internet Age. It looks like a cousin of virus hoaxes, pyramid schemes or urban legends. In fact, it is a superstition all of its own. 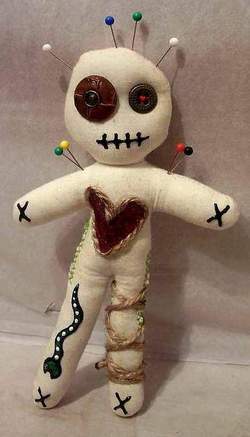 Sarah Palin voo doo doll? Image: Psychology Today. At the dawn of the Tech Revolution, it is easy to believe that we have become Postmodern, or post-Postmodern. There is less understanding of what that might mean if change that is too rapid. There is a lot of talk floating around that we 'are already living in the amazing future.' The gadgets confirm this; and where they leave off, the glossy ads pick up. They congratulate us on our multi-tasking attitudes, our sleek looks, our breathless, ever-new pace of life, our subterranean Web addictions, and our mass narcissism, funneled into our machines and mirrored back at us. Occasionally, something reminds us that there is a spiritual cost to all of this frenetic activity. Super-science sometimes walks hand in hand with the most primitive philosophies. Some evil practices we thought forever relegated to the 'barbaric' past reappear. Thus, we see the spread of modern slavery and piracy. When such phenomena reappear, we have to ask why. For example, why have witchcraft accusations been revived? 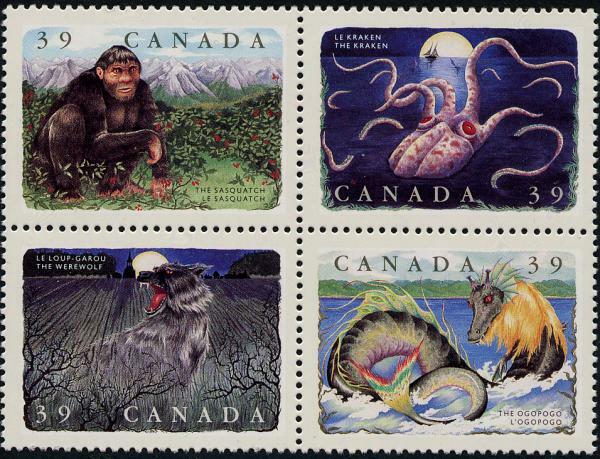 Four stamps of Canadian Cryptids: The Sasquatch, the Kraken, the Werewolf and the Ogopogo. © 1990 Canada Post. Image: Pib's Home on the Web. The mood of late October in Eastern Canada is constantly shifting. One minute, leaves gleam gold and crimson in the bright sunshine. The next minute, the landscape becomes a dead husk. There are two layers in the breeze. The top layer is late summer, the underlayer smells fresh, like snow. Its a strange scent, but if you know it, it's unmistakable, the smell of winter coming. The sun races toward the horizon faster every evening, and the moon springs up into the night sky like a Jack-in-the-Box. Out in the countryside, and further up in the woods, the landscape becomes much less friendly. It both heightens your senses of your surroundings and makes you doubt them more.